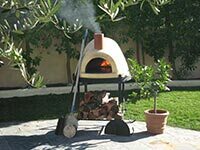 The Pompeii Oven project was born during a trip to Sorrento and Naples — the birthplace of pizza, and the home of both Pompeii and Herculaneum. 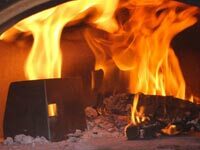 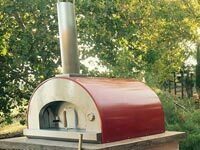 I had been interested in wood fire ovens for a number of years, and had built a number of them, both from brick and from modular pizza oven kits. 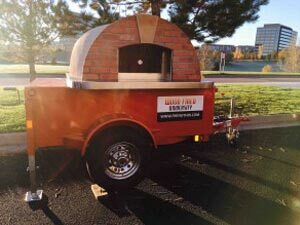 Like most visitors, I went looking forward to the pizza and to seeing Pompeii, but I was not prepared for how impressive both would be. 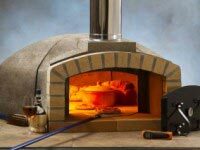 I had heard that ovens had been discovered at Pompeii, but at the same time I had read in various books and articles that ancient ovens were more simple than modern brick ovens, so I wasn’t expecting much. 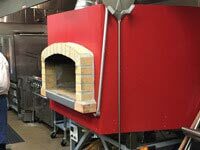 What I found was that the ovens in Pompeii are not only well-preserved, they also demonstrate excellent engineering skill. 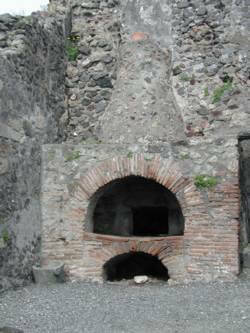 The Pompeii ovens were used inside shops, which also served as retail stores. 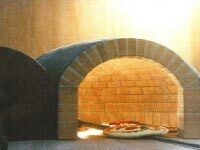 The pizza ovens were well-shaped, well-insulated, well-vented, and beautifully built. 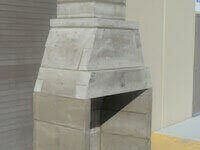 The floor was made from tempered terracotta tiles. 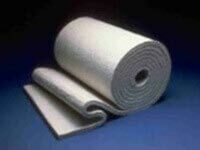 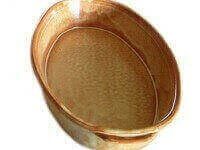 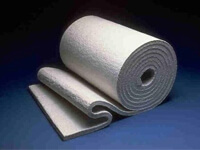 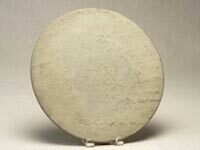 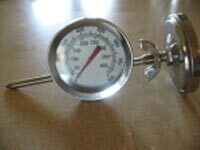 about 2″ thick, and the dome was a round, spherical shape. 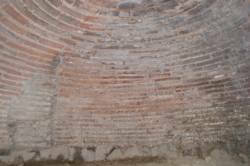 The dome was built using bricks set on their flat side and was covered with about 1″ of mortar, then insulated with a type of clay. 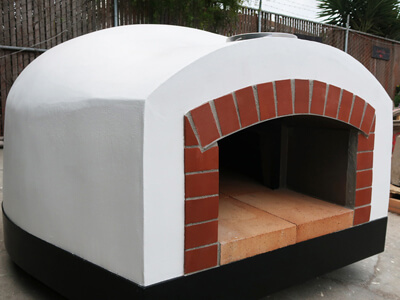 The neighborhoods where the ovens were located were also home to food shops, which had insulated terra cotta trays for serving both hot food and cold drinks. 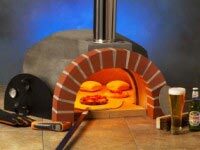 My guess is that the pizza and drink you could find in ancient Pompeii was better than what you see in today’s shopping mall pizzerias. 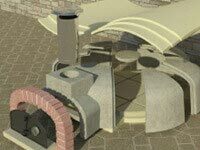 In further research, I have gone on to find that there are a number of examples of Roman craftsmanship using traditional materials, such as brick, concrete, and glass, which modern artisans do not yet fully understood, and cannot accurately copy. 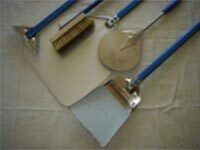 For example, there is a glass cameo technique that has not been re-created to this day. 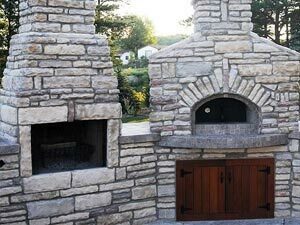 In fact, many of the”modern” ovens you find in the Italian countryside, typically built before the second war, are made from stone, not brick and terracotta — giving them a very rough and rustic quality. 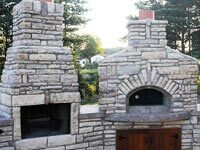 For example, the stone cooking floor on these stone ovens is very uneven, making cooking an adventure. 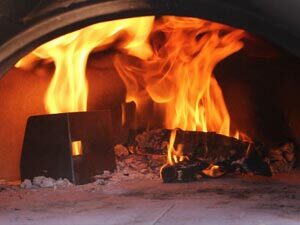 In a sense, like many other things, the brick oven took a brief step backward after the fall of the Roman empire. 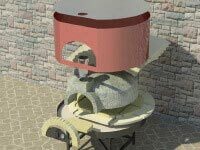 There are 33 brick ovens uncovered in Pompeii, and it was instructive to see that a number of them are in varying degrees of disrepair, which by luck show how the ovens were built. 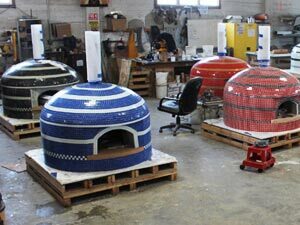 It is possible to see the edges of the cooking surfaces, the oven domes exposed from under their clay insulation, the oven vents and chimneys, and even a cross-section of the brickwork that made up the dome itself. 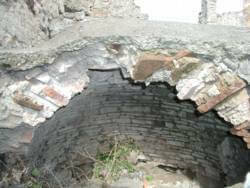 When you have the time, take a minute to click through our ancient Pompeii Oven photographs. 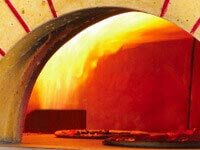 Later, after having spent hours with my head inside the ovens at the excavations, my family and I ventured out at night to eat some of the world’s best Pizza. 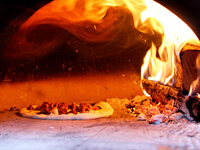 The Neapolitans have elevated pizza to an art form. 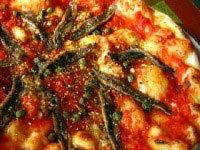 In December 2017, UNESCO (a United Nations’ Organization) recognized the Art of Neapolitan ‘Pizzaiuolo’ as part of the Intangible Cultural Heritage of Humanity. 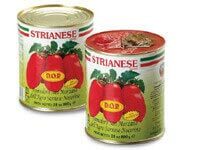 In fact, they are so proud of their culinary heritage that over 2 million people in three years lobbied UNESCO to consider this art form for designation! 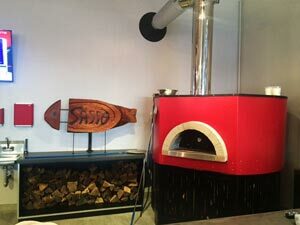 While the flamboyant art of twirling pizza dough is fun and inspiring, it was the flavors, folklore, and social customs surrounding the pizza-making process itself that also appealed to the committee and pizza-lovers around the world. 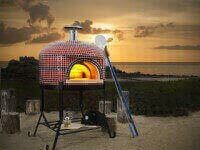 Read more about this art form and award here>>. 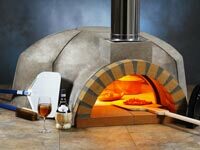 The Italians have also officially requested that the European Union regulate Pizza Napoletana the same way it controls Champagne, Chianti, Mozzarella, Parmesan and certain types of olive oil. 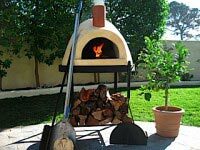 We have posted a translation of the Ministry of Agriculture’s description of Pizza Napoletana, which provides an interesting insight into what the Italians think a true pizza should be. 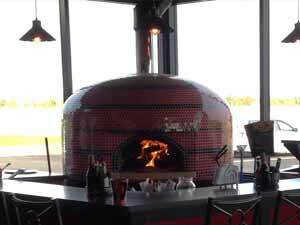 I was struck not only by the great pizza, but by the fact that the ovens were so similar to the Pompeii pizza ovens that I had seen during the day. 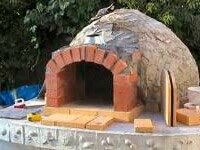 After a few evenings of talking with restaurant owners and Pizzaiolos, I hatched the idea to re-create the Pompeii Oven, and make it a project that could be done by hobbyists, enthusiasts, and builders around the world, and then got started working on the plans. 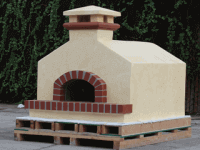 The next step was to actually build a Pompeii Oven Kit. 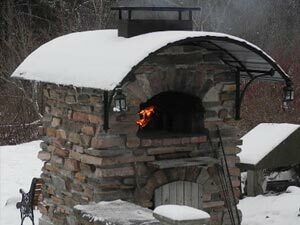 Jim Hatch and I met online at a brick oven user group, and began exploring how to best put the Pompeii pizza oven idea to work in the real world. 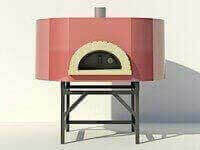 Jim’s creative solutions to oven design and construction issues were great, and we concluded that the oven would work for an English-speaking audience. 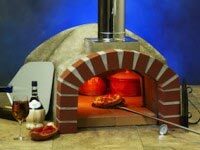 Jim took the plunge, and started the first Pompeii Oven Kit. 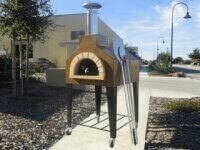 Jim completed his oven in July 2004, less than three months after we started talking about the idea. 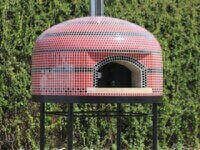 Jim’s oven is beautiful, and cooks wonderfully. 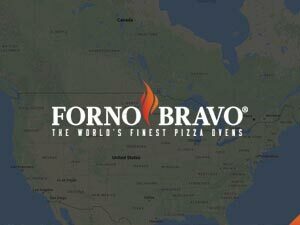 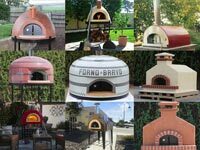 I cannot say enough how helpful Jim has been to the brick oven community and Forno Bravo! 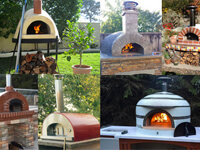 Scores of Pompeii Ovens have been built in America, Britain, Mexico, Belgium, Australia, New Zealand, South Africa, Sweden, the Virgin Islands, and Thailand, joining Italy’s estimated one million plus pizza ovens. 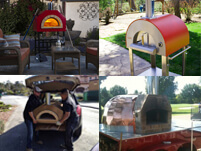 More Pompeii DIY Ovens are being built every day. 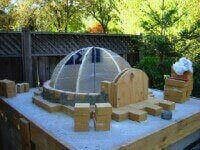 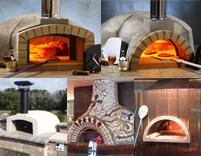 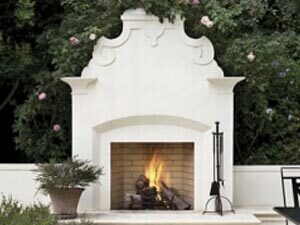 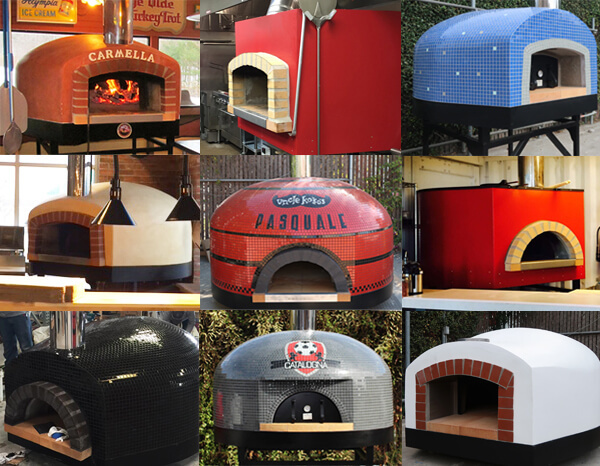 Today, builders have even more choices for their pizza oven projects. 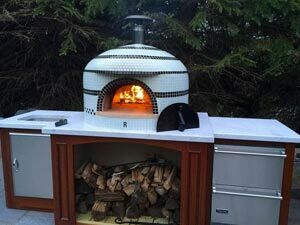 From-scratch DIY ovens are definitely a labor of love, and many owners now chose to work from a Forno Bravo modular pizza oven kit instead. 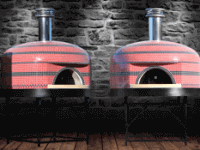 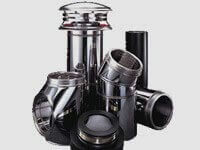 Kits simplify and speed up their oven build, improve their oven’s cooking and heat retention performance, and yet still allow for the hands-on, creative experience of doing the support and finish work to personalize the oven’s look and feel. 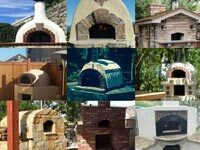 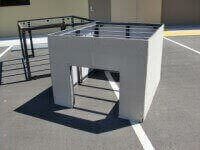 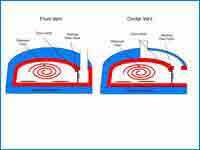 To continue, click on Oven Overview and get started learning about how to build a Pompeii oven from scratch. 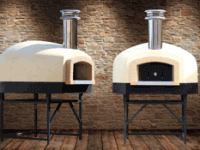 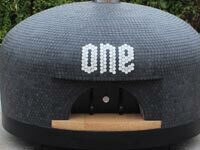 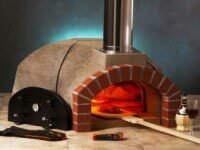 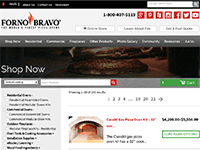 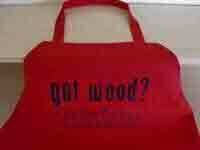 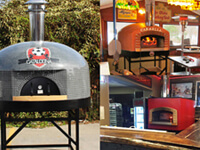 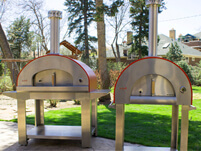 Click here to learn about kits and fully assembled pizza oven options. 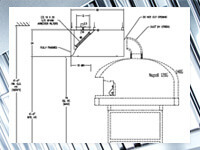 Or, jump to the Table of Contents.